Organize with ease! The durability, modularity, and simplicity of the versatile 4 Drawer Unit makes it the ideal solution for basements, attics and garages. 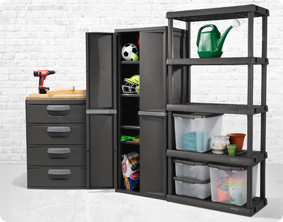 The trend forward Flat Gray color is both sleek and refined and complements a variety of living areas, offering additional storage options for pantries, utility /laundry areas, bedroom/dorms and mudrooms. The large-capacity drawers glide smoothly on hidden rollers, even under a heavy load, while the wide ergonomic comfort grip handles make opening and closing the drawers easy. The solid side walls offer strength and durability, while also concealing contents for a neat appearance. 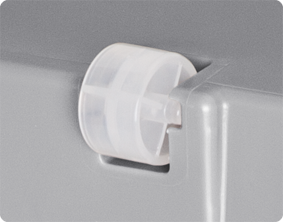 Heavy duty plastic will not dent, chip, peel or rust, ideal in a challenging environment. Create a custom storage solution with our other Hardware items, such as the 5 Shelf Shelving Unit, 4 Shelf Shelving Unit, and 4 Shelf Cabinet. The overall dimensions of this item are 35 3/4" x 25 5/8" x 19 1/4". Overall Assembled Size: 35 3/4" x 25 5/8" x 19 1/4"
Organize with ease. The durability, modularity, and simplicity of Sterilite’s Hardware Storage line makes it the ideal solution for basements, attics and garages. 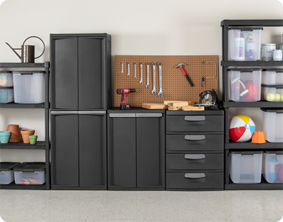 Custom solutions can be created with a combination of Cabinets, Shelving, Drawer Units, and Totes, which offer a clean, coordinated look and are rugged enough for the garage environment. 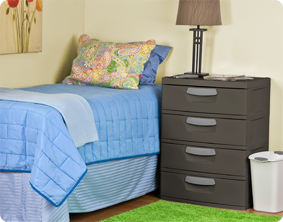 The versatile 4 Drawer Unit makes a great dresser for dorm rooms, bedrooms and guest rooms. Place in a closet for efficient use of storage space! 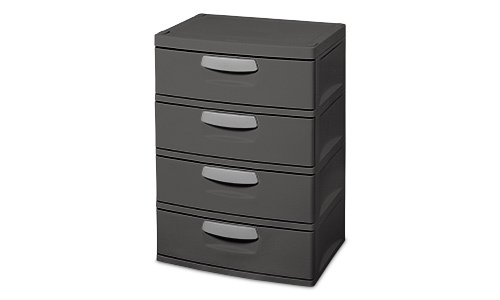 4 Drawer Unit is rated 4.7 out of 5 by 67. Rated 5 out of 5 by Kevin726 from The product is very good. I bought the 4 drawer unit in 2006-08. White was the only color available at the time. I still have the units, I bought 3of them. Still hold up. I would like to buy more. Or a set as pictured on product. Rated 1 out of 5 by KennesawSarah40 from Came already badly damaged. Probably wouldn’t hold up after use The product came to my house already badly damaged. The plastic was cracked and bent. I also had to pop back in a drawer cover. I couldn’t get a refund from Walmart because I threw away their damaged boxes instead of keeping it. I’m out $116. Rated 5 out of 5 by SMiles8690 from Great storage units It was intended to be used as a dresser for clothes but ended up being used for papers or to stash away small items. 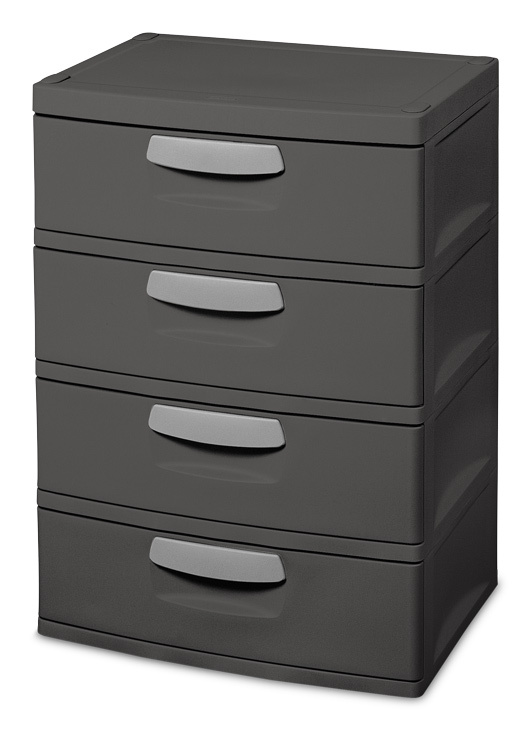 The drawers are very spacious and seem to hold a lot of weight and the drawers still close smoothly. Would love to purchase more but if I find a site that claims they sell them they are out of stock. I've even seen a 5 drawer unit but it was out of stock on a site. Pleeease make more accessible to purchase. Rated 5 out of 5 by Draw from Waterproof Purchased 2 of these for the garden. They are easy use. I put my garden tool in it. the drawers open and close very smoothly. They are sturdy and definitely worth the price I paid. I am very pleased with these and plan to purchase more. Rated 5 out of 5 by Cherokeekandy93 from Great for Kids rooms Purchased 4 of these for the kid's bedrooms. The are easy for the kids (ages 7 & 9) to use, the drawers open and close very smoothly. No mashed fingers. They are sturdy and definitely worth the price I paid. I am very pleased with these and plan to purchase more. Rated 2 out of 5 by mzstorage from big, roomy, heavy but poorly made bought this along with coordinating shelving unit, is in living room. have had for 1 week, nothing really heavy in the unit, it's for office/pc supplies. side panels between third and bottom drawer are warping, there's a big crack developed on the right side, left side is about to go. It's collapsing on itself! Cannot open or close bottom drawer normally, have to lean against unit (while bending over the drawer) and hold onto sides of drawer to get it to move at all. I'm really worried this is just going to go and I'm stuck with it. Very disappointed. Rated 5 out of 5 by KratomUnited from Need parts I've had 4 of these when I was traveling, had them set up in a trailer. I removed the top and stacked one on top of the other but now yrs later I want to set them all side by side and I can't find the tops. I love my cabinets but the company should sell parts for us loyal consumers. I can't remember when I bought them but something like 10 yrs and they're still durable and good as new. And that's hard because I'm not easy on things!